Atlas Copco Compressors has launched a new central controller which can be connected to up to sixteen compressors. 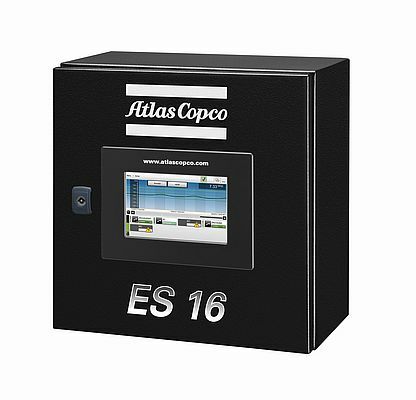 The ES 16 provides compressed air users with one central point of control for an entire compressed air network as it retrieves and processes information coming from compressors, dryers and other measurement equipment. The result is a dependable and efficient network that helps to save, on average, 10% of energy use in a compressor room. Compressors and dryers can be connected to the controller by means of a widely used CAN network. The device stores all machine and sensor data for up to one week. This allows users to see graphs and trends for analysis on the ES user interface or for a longer period and can also be consulted through the internet. With its optional control feature, the controller regulates air net pressure by starting/stopping the different sizes of machines and selecting their optimal operating points. Furthermore, it helps to keep air net pressure at the lowest possible level in order to gain additional energy savings. For example: lowering air net pressure by 1 bar not only reduces energy consumption by 7% but also air leakages by 13%.